Did you know that printers can now make actual 3 dimensional objects? Well this is a fairly new concept to me, one that I find to be super exciting. If any of you have ever made a garment before, you know that often times ideas or subtleties get lost in translation. This is because you are working in different planes. First, you take a two dimensional sketch, make a two dimensional paper pattern. After, the paper is cut and sewn into a 3-D object to fit the curvaceous human body. Just the slightest stray of the pencil can cause the entire garment to shift, and the design can be thrown off completely. But now we have this exciting new tool, 3-D software and its accompanying printer capabilities. Now a body can be scanned, and shapes in the software can be manipulated to fit perfectly around these 3 dimensional contours. It takes a lot of the guesswork out of manufacturing, and allows a designer to more accurately achieve their vision. A design from Francis Bitoni's 3_D design workshop at Pratt Institute. Design studio Francis Bitonti recently held a workshop on 3-D printing at Pratt Institute in Brooklyn. Students collaborated in teams of 3 to make garments. Using the body scans, they then created shapes and were able to manipulate them digitally using the printing technology. The designs they created offer a new paradigm on the meaning of beauty. Another design from the Francis Bitonti workshop. One of my favorite designers who utilizes 3-D printing is Iris van Herpen. Ms. van Herpen is a Dutch fashion designer who celebrates the intersection of craftsmanship and technology. Her collections explore many disciplines, including art, the natural world, and architecture. She has a way with evoking the otherworldly that I find truly inspirational. Below, see some of her designs that were created by 3-D printing. I wonder what a 3-D swimsuit could look like? Perhaps I could solve some of women's hangups about body images. 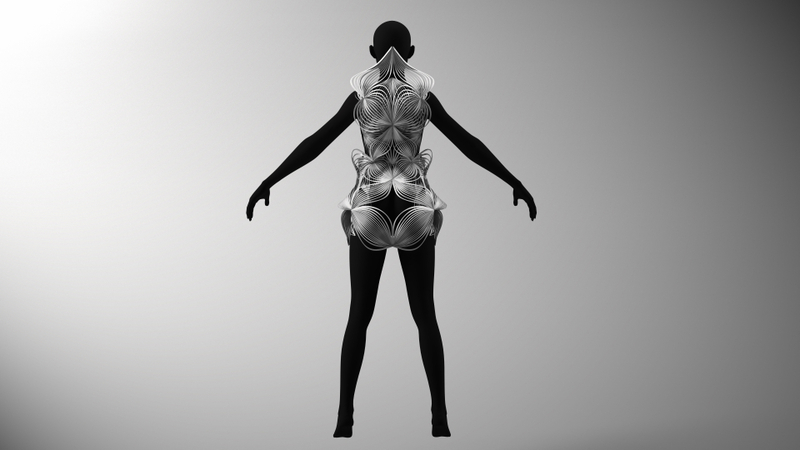 Could we create a suit that so subverts the form that we are forced to think about the female body from a fresh perspective? This sounds like an enticing challenge for me. Stay posted for some sketches!